Welcome to Nordby Upholstery and Canvas - your trusted source of premium quality of custom upholstery, awnings and custom boat covers in Brainerd Lakes. since 1952. From design to completion, nobody does custom upholstery Brainerd Lakes than Nordby Upholstery and Canvas. With over fifty years of unparalleled dedication to delivering nothing but the best products and services to valued clients in Walker, Crosslake, Nisswa, Whitefish Chain of Lakes, and other surrounding areas, we are the oldest and most trusted name in custom upholstery this side of the country. Located at 26106 Birch Ave, Nisswa, MN, 56468, U.S.A., we are the company to turn to if you're in search of the best custom boat interiors and/or custom boat covers Brainerd Lakes folks love. 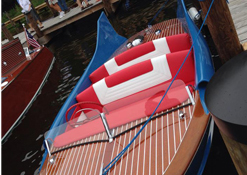 All our work is custom which means that each product we come out with is sure to fit your boat, or your home perfectly. All our customized products are designed and built according to our clients' specific needs. You can choose form a wide array of materials for your custom upholstery; from vinyl, canvas, and leather, you're sure to find exactly what you want. Here at Nordby Upholstery and Canvas you can expect excellent products and services at remarkably low prices. With our wealth of experience, we have built strong relationships with major suppliers, meaning we can get high quality materials needed for our products, at lower prices. The savings is then passed on to our clients which means you can get superior products and services at very affordable prices! Come to us for all your custom upholstery needs and let the experts with over five decades of excellence in the industry take care of all your upholstery requirements. Copyright © 2014 Nordby Upholstery and Canvas. All Rights Reserved.